First Prizes (8; awarded 1 per Entry Period): Each First Prize consists of one (1) bubly branded Giant Tumbling Timbers yard game; one (1) bubly branded Giant 4 Connect In A Row yard game; and one (1) $400.00 gift card (subject to terms and conditions as set by issuer) to a local establishment selected by Sponsor, in Sponsor’s sole discretion, which may be used towards food and beverage for winner’s game-night party. ARV: $650.00 each. 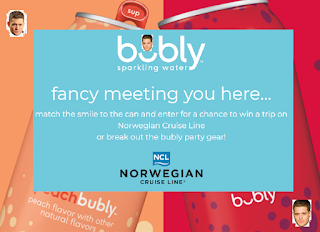 Grand Prize (1): The Grand Prize consists of a Norwegian cruise* for winner and three (3) guests; round-trip coach air transportation to/from a major airport nearest winner’s home to major airport nearest port of cruise departure for winner and three (3) guests; and any necessary hotel accommodations needed due to cruise dates/times prior to and/or after the cruise (one  quad-occupancy hotel room per night, up to a total of two  nights for the Grand Prize). Approximate Retail Value (“ARV”): Up to $7,800.00.